The use of satellite remote sensing for modeling net primary production (NPP) was evaluated in sixty boreal forest stands spanning a range of site conditions. The work included: (i) estimating annual phenological dynamics and photosynthetically active radiation (PAR) interception with remotely sensed spectral measurements, (ii) linking annually absorbed PAR (APAR) to measured NPP and quantifying variability in light use efficiency ("En"), (iii) evaluating sources of variability in "En" via mechanistic modeling of ecophysiology and associated carbon fluxes, particularly through analyses of respiratory carbon costs in relation to assimilation gains (the R:A ratio), (iv) assessing generalization of the results through an investigation of the evidence for evolutionary convergence in "En", the R:A ratio and assimilation per unit APAR (Eg). The analyses showed that observed variability in "En" reflects a decoupling of PAR harvesting and utilization, primarily as a result of differences in the R:A ratio. Links between "En", the R:A ratio and standing above-ground biomass were related to differences the carbon (energy) costs associated with synthesis and maintenance of plant constituents, and longevity (i.e. the payback period on investment in carbon gain). Estimating the R:A ratio from above-ground biomass, in order to compensate for variability in "En", was found to be problematic owing primarily to covariation of R and A with the amount of respiring biomass (i.e. sapwood and foliage). The analyses also showed that the differences in carbon costs between functional types (plants with related life history traits) resulted in convergence on "Eg" rather than en. Variability in "Eg" was, however, introduced by stomatal control at some stressed sites. These findings were supported by the remote sensing and simulation modeling results, and the synthesis of work related to evolutionary ecology. 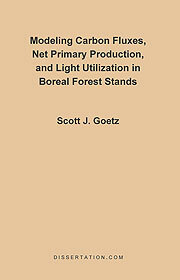 The primary conclusions are that variability in light utilization in these boreal forest stands was determined largely by respiratory carbon costs, and that NPP models based on light harvesting require augmentation with terms that reflect PAR utilization. Possible methods to address these issues, and their implications for NPP modeling over large areas, are discussed.